"Another way to think about Zittrain's point is to rephrase it this way: Who controls the technology you use? If you think you do, are you sure?" 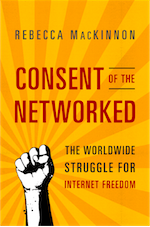 "ONI has noted that censorious governments have become increasingly subtle about the way they filter Internet content. One new frontier of Internet censorship, Deibert says, is “just-in-time filtering.” "
"To sum it up, Outing is a big enthusiast of citizen contributions, but is just not convinced that a successful website can run simply on user generated content." " ...I am not convinced that user content can a successful website make. I depart my latest venture nevertheless convinced that grassroots or user content is immensely powerful. We just have to figure out how best to leverage it." "Columnist Cory Doctorow describes how Facebook and other social networks have built-in self-destructs: They make it easy for you to be found by the people you're looking to avoid." Ohmynews has converted an abandoned primary school outside into "a community education center focused on teaching citizen journalism and user created content." Will Moss on the latest Edelman trust study in China: "Can the media here really loathe themselves that much?" Roland Soong gives us some very interesting statistics via Ming Pao on the total number of votes cast for pro-China, pro-democrat, and independent candidates in the district council elections. What will this mean for the Legco by-election on Sunday? Thomas Crampton shares a very useful Edelman study on Chinese people's trust levels towards different kinds of media. "Because lack of water, Mr Stone, a humble man in his 80's, has to rely on the American soda "Coca-Cola" everyday..."
"The skills ought to be taught in every single class, in every single course, right now. There’s no denying that. It’s just that getting it done takes a heck of a lot longer than “getting it.”"
"Ultimately, if the rumor has legs it will prove whether Facebook is looking to invest in China's social networking growth, or merely influence it." "The immediate comment from the mainstream critics is that the pan democrats are not performing well enough in their district service. However, many bloggers disagree." SCMP.com - Will DAB win speed up democracy momentum? "It has been suggested that Beijing would not allow Hong Kong to choose the chief executive and all legislators by universal suffrage until the pro-Beijing camp could command comfortable majorities in popular elections." "Tam said he believed the party's solid district work over the years has won them a better grasp of the public pulse and their desire for a more stable and harmonious society. ..."
"The Democratic Party was yesterday licking its wounds following its biggest election setback in 10 years." "Politicians will have to be more pragmatic and less political in the next elections." "Facebook is said to have offered $85 million to acquire Zhanzuo.com, a Chinese social networking site with seven million users." Hong Kong's pro-China parties, led by the Democratic Alliance for the Betterment and Progress of Hong Kong (DAB), did even better than expected in Sunday's District council elections, winning 115 out of 364, seats - up from the previous 62 seats. If you read Chinese all the numbers are here. English-language news reports here and here. Offers of resignations were heard this morning on the Democratic side. It is also human nature to follow the leader. And that is what the DAB is all about. They're taking orders from the Big Party over the border, demonstrating a lockstep discipline that Republican Chairman Karl Rove can only dream of. Meanwhile the pan-Democrats are trying to forge a winning team from a loud, messy family that includes wealthy barristers, feisty unionists, grassroots activists and civil servants with expensive hairdos. The DAB aren't really great campaigners. Their "platform" consists of repeating the correct party line, and their repertoire of tactics is straight out of the old school political playbook: smears, threats and a chicken and rice box for every voter. But compared to the pan-Dems, they look like pros. She quotes Long Hair's final analysis: "We messed up the district council elections. We should have been more organized." Through the work of my students I've been trying to follow this whole thing pretty closely. You can find more about Hong Kong's District Council elections at our Hong Kong Stories website than you'll find anywhere else in English that I know of. It's clearly student work - most had never covered an election before and some have still got some things to learn about reporting- but it gives a flavor I think for the atmosphere, issues, developments and personalities involved with Sunday's race. Hong Kong's elections are a great testing ground for the folks up North in Beijing: They're learning how to go about winning elections against liberal democrats. As of 3:30am Hong Kong time, preliminary results in the Chinese media show the pro-China parties with a strong lead. The Democratic Alliance for the Betterment of Hong Kong (DAB) is now anticipating a total of 114 seats, up from 62. That's rather big. This special page (in Chinese) on the Ming Pao website continues to be updated with all the latest. If Tsang was genuinely not concerned about "heating up the election" and believed that the DAB candidates were superior to the pan-democrats, there ought to be debates at public forums instead of evasions that result in insufficient information. No matter how mature the voters are, how do they make rational voters? Sophistry is about criticizing the opponent while concealing one's weakness. Yet, if the pan-democrats are overwhelmingly defeated in the district council elections, I would still feel that it was the fault of the pan-democrats. Regardless of the strategies and tactics of their opponents, they ought to have no fear no matter political conspiracies are worked up by their opponents? But if Jasper Tsang Yuk-sing said he trust the democratic choice of the people of Hong Kong, then why doesn't the DAB believe that the people of Hong Kong should be able to choose their own Chief Executive in 2002? Could they believe in the people when it is advantageous to them, but not when it is not to their advantage? No matter what the outcome is today, no matter whether the pan-democrats win or lose, it is the choice made by the people of Hong Kong. That should be respected and accepted. Wins or losses are less important than learning the lessons and improving oneself, while avoiding the unnecessary arguments. It will be interesting to hear what the pundits have to say in the morning. "The people who need emergency cannot be democrats, for they can only be those people who wave the flag of "democracy" but are unwilling to do the practical work to gain the support of the voters." "Although district councilors wield little real power, the polls are expected to be the most fiercely contested since Hong Kong reverted from British to Chinese rule in 1997..."
HONG KONG (Reuters) - Hong Kong's pro-democracy camp faces a stiff test of its popularity this Sunday with four-yearly district council elections that could impact on bigger polls ahead and ongoing constitutional reforms aimed at full democracy. "Politicians issued last-minute calls to voters to cast their ballots in today's district council elections, with some warning that a low turnout might send a signal that Hongkongers were losing interest in democratisation." "Hong Kong's pro-democracy parties were bracing themselves for heavy losses after relatively few voters turned out for Sunday's district council elections."